Vicenza, about 40 miles west of Venice, is home to enough Palladian villas, ancient bridges and grand basilicas to make one imagine the Renaissance was less about culture than simply construction. 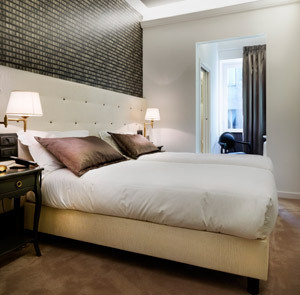 So it’s no surprise that the G Boutique Hotel, in the center of town, is housed in a former palazzo. What’s unexpected is how thoroughly modern the place is. The lighting alone could be a lesson in modern design — spidery red chandeliers, hanging lights that look like sculptural mobiles, a lamp the color of green sea-glass that throws aquatic patterns across the walls. 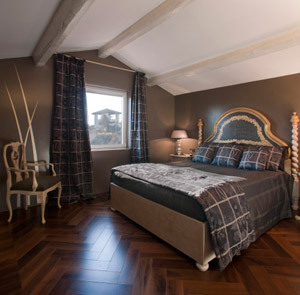 The rooms are furnished with custom-made Italian furniture, with Andrew Martin–designed wallpaper and Casamance linens. Upgrade to one of the four suites and the decor gets bolder. 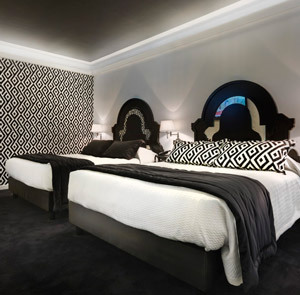 The Wow suite is almost exclusively black, white and metallic — a black headboard with mirrored patterning, black-and-white patterned pillows, black tiles and an oversized white tub in the bathroom. The showers are perhaps the boldest choice of all. In the Vicenzia, Deco and Impero suites the glass-walled showers are set right in the middle of the room, between the bedroom and bathroom. If that’s not steamy enough, the shower in the Impero suite has an oversized arched mirror and a chair facing it, just outside the glass wall. If anything, the G Boutique’s ultra-modern design serves, by way of contrast, to amplify Vicenza’s historical aspect. Here you can turn off your enormous wall-mounted LCD television and head out to the nearby Teatro Olimpico. Built by Andrea Palladio himself in the 1580s, it’s one of just three surviving Renaissance theaters. The trompe l’oeil scenery onstage, made for the theater’s very first production, is the oldest surviving stage set in existence, and the theater still stages plays and classical concerts.